Refer to https://ichigojam.net/index-en.html about original (LPC1114) edition. Basically, it should work with all models of Raspberry Pi. Compatibility is confirmed with the following models. * For some keyboards, The response of "Zero" series and "Model A+" series is not good for now. However, Other than that, you can use those same as "Model B/B+" series. Using a PC, Format a microSD card with FAT16 or FAT32. Copy contents of the directory including readme.txt to the microSD card. It's nice to prepare microSD card with capacity up to 32GB and use SD Memory Card Formatter. Supported file systems are FAT16 and FAT32. If it does not work properly, the compatibility between Raspberry Pi and the microSD card may not be good. Please refer to [Working / Non-working SD cards] and try other cards. To update to the latest version, follow the procedure below. * Since updating the SAVE and LOAD command specifications to support EEPROM with ver1.2.5, it may be necessary to adjust the file name in the "files" directory at the time of update. Please see "SAVE/LOAD Destination" for details. 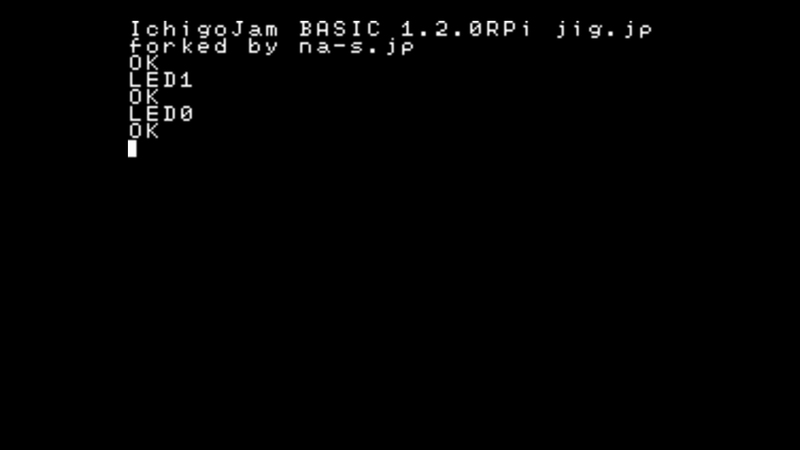 Download and unpack the latest version of IchigoJam BASIC RPi from the download page. Overwrite the file on the microSD card with the file generated by downloading and unpacking it. Copy (restore) files directory, config.txt, keymap.txt from backup to microSD card. To configure the default keyboard layout, edit keymap.txt in microSD card. * Changing the keyboard layout after startup is also available by using KBD command. Insert the microSD card into Raspberry Pi. Connect display device and keyboard. Connect USB cable to turn on the power. If the screen looks like the one on the left, it's successful! Input "LED1" from keyboard and press [Enter] key. Input "LED0" from keyboard and press [Enter] key. Input "10 LED1: WAIT30" from keyboard and press [Enter] key. Input "20 LED0: WAIT30" from keyboard and press [Enter] key. Input "30 GOTO10" from keyboard and press [Enter] key. Input "RUN" from keyboard and press [Enter] key. To stop blinking, press [Esc] key. 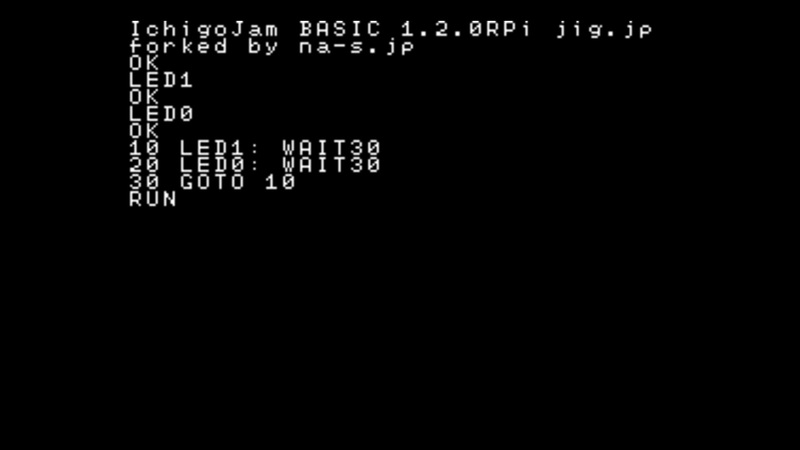 IchigoJam BASIC RPi is ported based on version 1.2.4(1.2b56)(*) of the original edition (LPC1114 edition). but the following points are different. * ver1.2.5 or later. Before ver1.2.4, ported based on ver1.2.3 of LPC1114 edition. *1 IoT.IN and IoT.OUT are implemented in LPC1114 edition in beta version. *2 From ver1.2.5, the setting is saved in keymap.txt with the KBD command. * The numerical value returned by LANG and the numerical value set by KBD are different. LANG returns the language number of the font to be displayed when enabling Kana input with IchigoJam in use. The save destination of the program by the SAVE, LOAD command is as follows. With ver1.2.5, we changed the specification to support EEPROM. When updating from ver1.2.4 or earlier to ver1.2.5 or later, adjust the file name in the "files" directory of the microSD card to take over the created program. In addition, there are following differences. where the electric current actually flows is as follows. by using I2CW/I2CR command is as follows. when communicate using UART is as follows. by using BEEP/PLAY command is as follows. [issue 1005] For some keyboards, The response of "Zero" series and "Model A+" series is not good. [issue 1008] I2CW returns zero (success), in situations where non-zero (failure) should be returned, such as access to a nonexistent address. [issue 1009] LED command does not work on Raspberry Pi 3 Model B+. [issue 1007] The cursor does not blink. [issue 1006] The value of TICK and the number of screen refreshes are not synchronized. [issue 1004] Screen changes by CLS, SCROLL, POKE, COPY, CLP are not reflected until the next PRINT processing. [issue 1003] Auto repeat does not work on some keyboards. [issue 1002] Shift, Ctrl, Alt do not work on some keyboards. [issue 1001] Home, End, Page Up, Page Down, Ins on the Numeric Keypad do not work on some keyboards. Q. The screen flips vertically, when using "Raspberry Pi 7 inch Touchscreen Display". A. It can be adjusted by adding lcd_rotate=2 to config.txt as with Raspbian. Q. There is no button on the raspberry pi, how to start the program automatically when turn on the power? A. If power is turned on without connecting the keyboard, FILE0 is automatically executed (LRUN0). Q. Can Composite Video (RCA terminal) be used for display output? A. Yes. Similar to Raspbian, a signal is output from the 3.5 mm jack. The sound is output from the physical PIN 29 (SND). Q. I want to use a Japanese keyboard. A. You can switch it with the KBD command. Try KBD1. Q. I want to use a US keyboard. A. You can switch it with the KBD command. Try KBD0. Q. Does it support analog input? A. No. Use external modules such as AD Converter connecting via I2C and so on. For inquiries, please contact below.